Imagine coming home to find that your pet parrot has gone on a shopping spree ordering all the foods he likes to eat? Well, this is exactly what happened with Marion Wischnewski, a former staff member of National Animal Trust Sanctuary in UK who adopted a foul-mouthed African Grey parrot. The African Grey parrot Rocco added items into a virtual shopping list using Amazon Echo, while she and her husband were out. 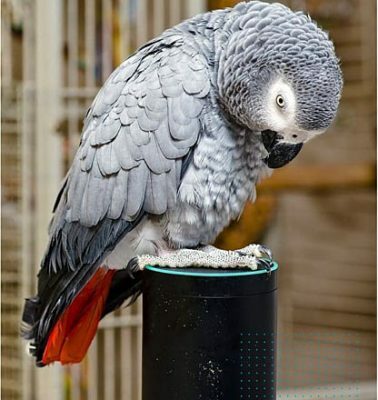 The parrot which is considered to be one of the most intelligent birds around made a new talking friend in Amazon Alexa. When the smart parrot realised he could order food to eat using the voice activated personal assistant, he got busy ordering watermelons, broccoli, raisins, a light bulb and even a kite. According to Marion, the bird has become fast friends with Alexa who often plays American band Kings of Leon’s songs, who are Rocco’s favourite and she often comes home to find music playing. It is now a routine for her to cancel all the items he has ordered during the day using Alexa.